2014, I welcome you! 2013 has been a bit of a roller coaster with highs and lows, but this year is going to be about balance. To work smart and to use time wisely, leaving me more time to do the things that make me happy. To be more balanced when it comes to food and to do a range of exercise, i.e to bring back yoga into my life! I started my blog as a way of keeping in touch with those I love, but it hasn't really turned out that way; although my parents have constantly been my biggest fans (thank you!). I've enjoyed sharing here and getting to know people through blogs, but I feel I am spending too much time on my phone and not enough of my time in the moment. 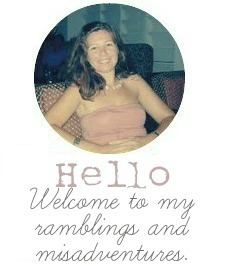 So, as part of a more balanced year, I've decided to dip out of the blogosphere for now. Family and friends know I will email with news of adventures or running photos (!) and if you would still like to see snapshots of what I'm doing, I'm still going to Instagram @africaandbeyond (I really like it at the moment- it is quick and easy- it's all about balance). Thank you for reading my blog over the years. I've grown a lot since my first entry whilst I was living in Uganda. I've learnt a lot about myself during my adventures these past three years and writing about them has been part of my journey; first in Uganda, then in Kenya and now here in Kuwait, and holidays; in Holland, Spain, France, Germany, Ireland, Canada, Bahrain, Dubai, the Maldives, Thailand, Australia and back home in Scotland. Thank you for commenting on posts and cheering me on in spirit with my running. 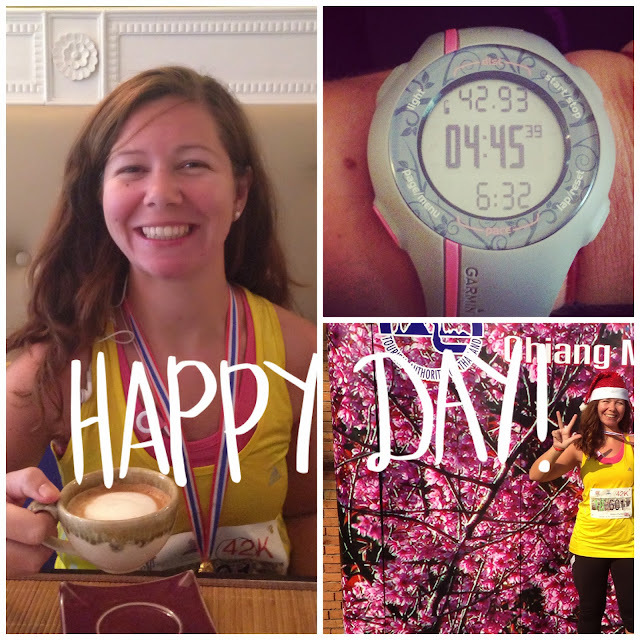 My first 3 marathons in 2013 have probably been my biggest achievements to date (apart from surviving my first year of teaching!) and every running buddy and cheerleader helped me cross the finish line. We don't know what the New Year will bring. Hopefully happiness and peace within us all. Maybe I'll end up coming back here and writing, but for now the time feels right for change. Yesterday was a happy day; for the first time I ran sub 5 hours. It was a 4am start, so I was back in the hotel before breakfast finished! Chiang Mai was fantastic. I'm now on my way to Melbourne to have a MERRY time. I've been sick for over a week, I've been fighting it with vitamin C and powders and tablets. Everyone is sick, but we are all determined to be involved with everything Christmassy that is on offer. School is very anti-Christmas. The word is not uttered, parties do not happen, special winter crafts are not done...or done in secret behind a closed door! Many Kuwaitis put up a tree in there homes and gives gifts...but at school we are supposed to follow the curriculum to that final bell. We ho and hum, but we made it...the holidays have arrived. As an international teacher the Christmas holidays are my favourite. All the excitement of holidays away but with none of the wretched goodbyes. Just lots of love and hugs and 'can't wait to hear about it in January'. Today I started packing- sundresses, bikinis and Christmas goodies for Kerry. I'm so excited about my trip to Melbourne that they are overriding my nerves for the marathon in Thailand. I hate this part of the marathon training though...the waiting...the trusting the plan...the 'not eating too much' (hahaha) and resting part. It makes me feel unfit and unprepared. But enough of that-the holidays are here and I'm so happy about that. Go for a wee run on the 22nd ( or 21st night) and send me good vibes please! If I don't check in before the big day, Merry Christmas!!! Old copies of Runner's World magazines. I just want to flick pages or read an article in bed, hoping by reading about running I'll feel better prepared about my upcoming marathon. Usually though the articles have the opposite effect and I have butterflies in my tummy as I try to fall asleep. Mad Men series 6. Amazing!!! I think it is better than the last couple. I am still constantly swinging between love and hate for Don Draper. Beetroot juice. Daily. The shelves are empty when I leave the supermarket. Far too many mince pies. They will be weighing me down on my run! I started playing it this week while I baked in the kitchen-it seriously makes me so happy! ( Am easily pleased!) I also get very excited when the American radio station VOA (which I sometimes listen to in the car) plays a Christmas song, momentarily I forget that I am living in Kuwait. My marathon....which is next week in Thailand...arrrr....and the holidays!! I am so excited about my trip to Australia after my marathon that I've had a few sleepless nights this week. I am so excited ! Did I just say that! Can't wait, can't wait, can't wait. I'm also thinking about all my friends and family that I won't see this Christmas...but I've had some lovely chats on the phone recently and that helps. I'll be home in Scotland for a holiday before you know it! The beautiful sunrises and sunsets at the moment. I don't think Kuwait has looked so pretty! This was taken when the Red Arrows came to Kuwait a couple of weeks ago. Happy. I'm happy at work, although running on fumes at the moment; I'm lucky to be working with such great people this year and I'm not taking that for granted. I'm also so happy more of my friends have recently taken up running. More running buddies for me! !